All transactions are safe and secure with a reliable history in online purchasing behind each of our associates. Buy the Little Miss Bossy t-shirt to own Little Miss clothing and merchandise. 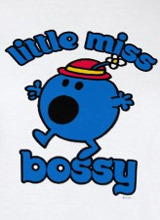 This is the character that the Little Miss books all began with, Little Miss Bossy. She is rude to everyone she meets and thinks that bossing them around is acceptable behavior but it's not. Her intolerable behavior leads a wizard to put a pair of magical boots upon her feet that send her on long exhausting ventures every time she gets bossy. She quickly learns that if she says "please" the wizard will remove the boots. After being given a quick reminder that this could all happen again in the blink of an eye if she gets an attitude, all is forgiven. Get this Little Miss Bossy t-shirt now! In addition to the Little Miss Bossy tee above, browse the Little Miss Clothing Gallery for more apparel like men's and women's clothes, kids shirts or hoodies.